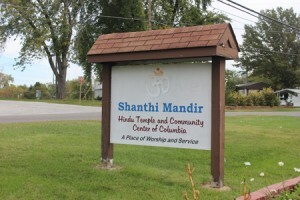 Shanthi Mandir is located at 2006 Holly Avenue, Columbia, MO 65201. This temple building with four small rooms and a large hall can accommodate groups of 100 people or less. Tables and chairs are available for use. Persons reserving the facility must be members of HTCC and 21 years of age or older.The Shanthi Mandir is the Hindu Temple and Community Center for Central Missouri. A place of worship and service, with a fully voluntary staff. No smoking allowed inside the temple building. No Alcohol allowed inside the temple building. No non-vegetarian food permitted inside the building. Side entrances are restricted for routine use. They must be used only in emergencies. Chairs are located in rooms/hall and tables are located in a storage closet. Tables and chairs are for indoor use only. Fire extinguishers are located near the front door and in the prayer hall. Users will sign acknowledgment of Rules and Regulations at time of key pick up. Users provide for decorations, setup, and cleanup. One-half hour before and after reservation times is allowed for setup and cleanup. Reservations must be made by contacting Inder Khurana at 882-3474. Key pickup can be arranged by contacting Inder Khurana at 882-3474. If Inder can’t be reached, then key pick-up can be arranged with H. R. Chandrasekhar at 446-6143 or V. S. Gopalaratnam at 446-0663. Key must be returned the next business day before 12:00 Noon. Follow Check-out Procedures when leaving facility.